To me though, it evokes the rolling hills of Tuscany, and fantastic Sangiovese wines. 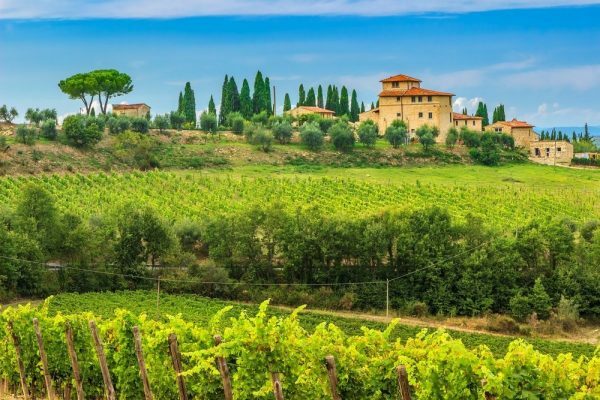 The Chianti wine region covers a large area across much of Tuscany’s most beautiful landscape. It’s situated between the towns of Florence (to the North) and Siena (to the South). Chianti, is produced in eight distinct areas. It has long been considered to be “The most Italian” of all Italian wines. WHAT IS THE HERITAGE OF CHIANTI? As with most of Italy, wine has been produced in Chianti for over 2000 years, since Etruscan times. The name Chianti first appears in writings around the 13th Century. But it was much later, in 1716 that its borders are clearly defined by an edict issued by Gran duke Cosimo III de’ Medici. Within Chianti, there are seven sub-areas, the most well known of which is called Chianti Classico, which produces the finest wines. This sub-appellation was founded in 1924 by the Chianti Classico Wine Consortium. This group of local producers got together in order to protect and promote their wines and prevent wine fraud. Their logo, the black cockerel is now present on all Chianti Classico bottles. It is only 52 years later that the Chianti Classico obtained the status of DOCG as a result of the work made on the quality(Denominazione d’Orgine Controllata e Garantita). This is the highest quality Italian wines. 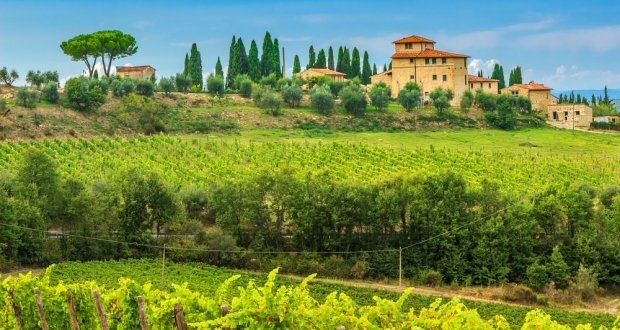 The climate of Tuscany, and more specifically that of Chianti, is Mediterranean. In short, this means hot, dry summers and mild winters. This climate as well as the clay soils with the presence of pebbles and sandstone, shape the character of the wines. WHAT ARE THE MAIN GRAPE VARIETIES OF CHIANTI? The star varietal of Chianti and Chianti Classico is Sangiovese. Sangiovese has to form at least 75% of any blend, and its not uncommon that Chianti wines will be 100% Sangiovese. The other main varieties of this appellation are Canaiolo, Colorino, Cabernet Sauvignon and Merlot. Sangiovese is a fairly thin-skinned grape variety, hence the light colour of the wines. As I just mentioned, the colour of Chianti is light ruby red. The dominant aromas of Sangiovese are both fruity (strawberry, cherry) and spicy (oregano and clove). There are definitely tannins and acidity in Chianti wines, hence making them great food wines. As a result, it maybe makes them a little more difficult to appreciate by themselves though, especially if you’re not a seasoned wine amateur. WHAT FOOD TO PAIR WITH CHIANTI WINE? Wine and food pairing with Italian wine is simple: simply find out what food is typical from the region and you’ll almost sure it’ll match the wines. You need to look for rich dishes with a good fat and protein content so meat dishes work especially well. This is very much the case in Chianti. Especially relevant will be dishes such fagioli con salsiccia (beans with sausage and tomato sauce), chicken liver paté, pappardelle alla lepre (pasta with wild hare). All these dishes will go beautifully with Chianti wines. For another typical Tuscan dish, you could match a light Chianti with Acquacotta. 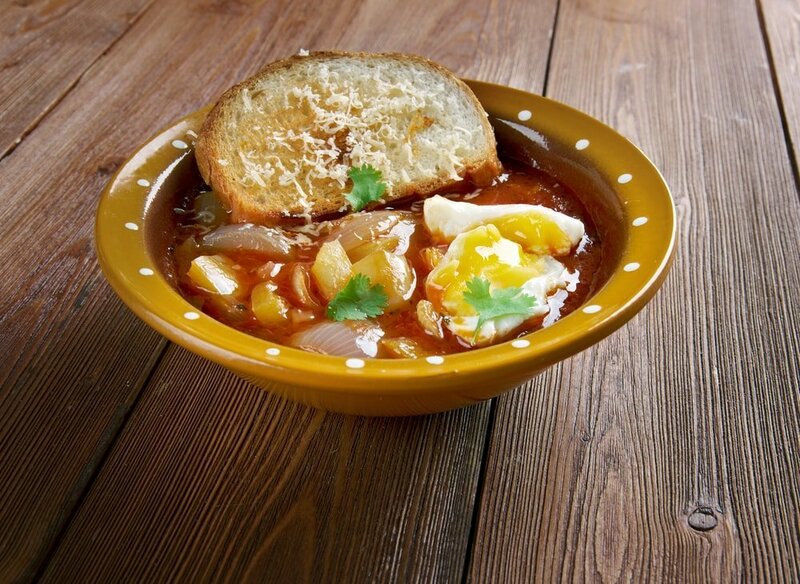 This simple dish is a vegetable (mostly bean) soup enriched with a poached egg. More generally, anything meaty, with a tomato sauce will be a great match, and yes, as a result, that means a lot of pizzas will be a good match with Chianti wines.